Amazon Kindle Paperwhite 2nd Gen (2013) DP75SDI. Amazon Kindle PaperWhite 2nd Gen 6". For Amazon Kindle PaperWhite DP75SDI 6" 2013 2014 2nd/3rd Generation. Capacity : 1420mAh. Battery Type : Li-ion. 1.Li-Ion Laptop Battery 10.8V and 11.1V are in common use. Fits: D01100, Kindle 4, Kindle 4G, Kindle 5, Kindle 6. Amazon Kindle 4 Battery. Fits & Replaces Amazon. Battery for Amazon Kindle 1 eBook Reader Book 1st Generation Gen A00100 BA1001 IBYKB BPA-256 ERDA100. MPN# IBYKB. Lenmar ERDA100. Battery Amazon Kindle 1 1st Generation Gen a00100. Amazon Kindle 1st Generation. Trending at $12.59eBay determines this price through a machine learned model of the product's sale prices within the last 90 days. Replacement Battery for Amazon Kindle A00100. Condition is New. Shipped with USPS First Class Package. Battery for Amazon Kindle 2 II eBook Reader Book eReader 2nd Generation Gen DX S11S01A DR-A011. Battery Amazon Kindle 2 eBook Reader 2nd S11S01A. Amazon Kindle 2 eBook Reader. Amazon Kindle II DX eReader. Compatible with the following Amazon Kindle models: D01100, Kindle 4 (4th Generation), Kindle 4G, Kindle 5 (5th Generation) & Kindle 6 (6th Generation). Includes Free Installation Tools. AMAZON KINDLE 3 III Wifi Keyboard. AMAZON, 3HT7G, Kindle Fire 8.9. S2012-002. 58-000015. ( Replaces ). KINDLEFIREHD89, KINDLEFIREHD894G. Volts :3.7 Volts. Amazon Kindle Paperwhite 2nd Gen (2013) DP75SDI. For Amazon Kindle PaperWhite DP75SDI 6" 2013 2014 2nd/3rd Generation. Amazon Kindle PaperWhite 2nd Gen 6". Battery Type : Li-ion. 1.Li-Ion Laptop Battery 10.8V and 11.1V are in common use. Item Specification: P/N: 58-000049 Model No. : MC-354775-05 Votage:3.7V Standard capacity: 1420mAh (5.25Wh) Color:Blue Cell material: Lithium Polymer New bulk packaged, no retail packaging Package:1x Battery Tool Compatility： Fit For Amazon Kindle Paperwhite 2nd Gen (2013), Fit For Amazon Kindle Paperwhite 3rd Gen (2015) . 6000mAh 26S1004, 58-000065 Battery Replacement for Amazon Kindle Fire HDX 8.9” GU045RW Tablet with Installation Tools. Replace Part Numbers: 26S1001-A1(1ICP4/82/138), 26S1005, 26S1005-S, 58-000055, 58-000055(1ICP4/82/138), S12-T2-D. AMAZON Kindle Fire HD 3rd, Kindle HDX 7.0, KC5, P48WVB4. Battery Type : Li-ion. 1.Li-Ion Laptop Battery 10.8V and 11.1V are in common use. For Amazon Kindle Fire 7" 5th Gen SV98LN. Capacity: 2980mAh. 1 x New Replace Battery. Your understanding and support will be highly appreciated! 58-000035(11cp4/82/138) 26S1001 S2012-001-d. For Amazon Kindle Fire Hd 7" X43Z60. Battery Capacity: 4400mAh / 16.43Wh. Samsung Galaxy Tab 3 7.0 SM-T217 Samsung Galaxy Tab 3 7.0 SM-T217 Samsung Galaxy Tab 3 7.0 SM-T217. Product Description: Type: Battery Condition: Brand New . 100% Tested and 100% Working. Quality: 100% Replacement and High Quality, Each Product Is tested before shipping and are 100% working Warranty: 12-month Votage:3.7V Standard capacity: 1830mAh (6.8Wh) Minimal capacity: 1750mAh (6.5Wh) Color:Black Cell material: Li-ion Polymer . Replace Part Numbers: 26S1004, 58-000065,58-000061 26S1004-A, 26S1004-A(1ICP3/98/82-2). 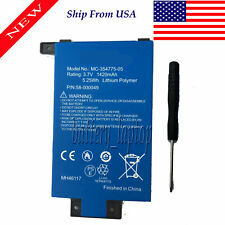 Battery 58-000061 S12-T3 For Amazon Kindle Fire HDX 8.9". Notice: this item doesn't fit for Kindle fire HD 8.9". Battery For Amazon Kindle Fire 8” 7 Generation SX034QT. All of our parts ship from our warehouse here in California. All of our parts are meticulously tested to ensure a high standard of quality and full functionality. We do our best to highlight any defect in the description. We have sold thousands of parts on eBay. All of our parts come with our worry free 30-day money-back guarantee. Buy with confidence. (For Amazon Kindle Fire 7" 5th Gen SV98LN. Battery Capacity: 2980mAh. Warranty: Full One Year. excluded). Compatible Part Number. Amazon Kindle 2, Kindle II, Kindle DX. Not for use with Kindle Fire 2 Wi-Fi. S11S01A - CM2-CS160 3G Version Only . Volts :3.7 Volts. Fits and Replaces. Fits & Replaces OEM P/N. 58-000035(11cp4/82/138) 26S1001 S2012-001-d. For Amazon Kindle Fire Hd 7" X43Z60. Samsung Galaxy Tab 3 7.0 SM-T217 Samsung Galaxy Tab 3 7.0 SM-T217 Samsung Galaxy Tab 3 7.0 SM-T217. Battery Capacity: 4400mAh / 16.43Wh. Amazon Kindle Fire HD 6" 4th gen PW98VM battery Replacement 3400mAh. All of our parts ship from our warehouse here in California. All of our parts are meticulously tested to ensure a high standard of quality and full functionality. We do our best to highlight any defect in the description. We have sold thousands of parts on eBay. All of our parts come with our worry free 30-day money-back guarantee. Buy with confidence. Kindle Fire HD 7" X43Z60. & Kindle Fire HD 2013 7" P48WVB4. Capacity : 4000mAh. Battery model :26S1001. Battery type: 58-000035. 1.Li-Ion Laptop Battery 10.8V and 11.1V are in common use. 2.Li-Ion Laptop Battery 14.4V and 14.8V are in common use.